Studies on morphology, fertility and chromosome pairing behavior in meiosis of Iris japonica, I. confusa and their artificial hybrids were carried out. 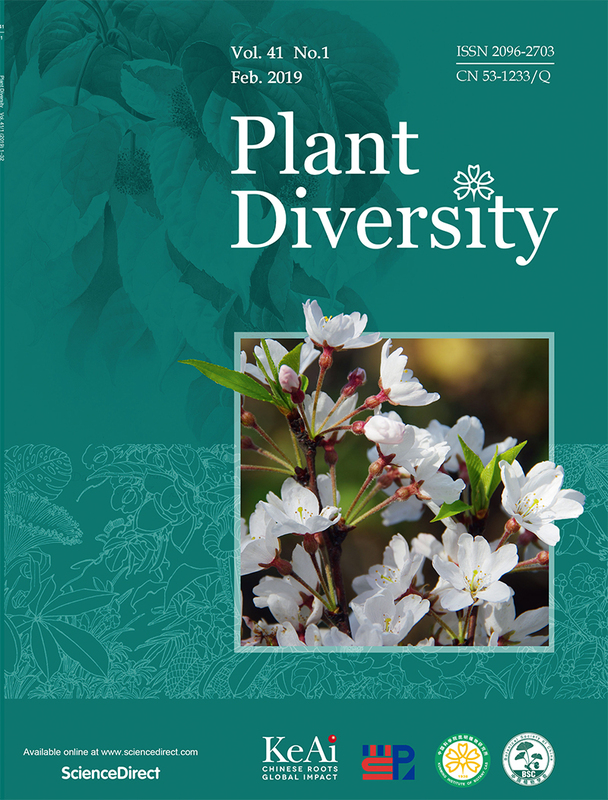 It is concluded from the results that: (1) Morpho-logically I. japonica was similar to I.confusa, and the general appearance of the interspecific hybrid pla-nts was intermediate between their parents. (2) It was easy to obtain the hybrid seeds, and most of the seeds germinated normally and developed into vigorous plants. The chromosome number was 30 in root-tip cells of the hybrid. The Fi hybrids showed a comparatively high chromosomal pairing in meiosis of pollen mother cells at MI with an average of 13.90 bivalents, and mean meiotic configuration was 0.95Ⅰ + 5.95Ⅱ (rod) +7.95Ⅱ (ring) + 0.05 Ⅲ + 0.27Ⅳ . This result indicated that I. japonica and I. confusa shared the highly homologous genomes and were closely related. etc. 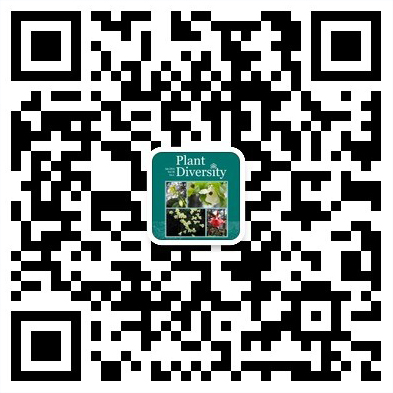 A new ionone derivative and six known flavonoids were isolated from the aerial parts of Isodon leucophyllus (Dunn) Kudo. Their structures were respectively elucidated as 13-carboxy-blumenol C (1), 5, 7, 3', 4'-tetramethoxyflavone (2), cirsiliol (3), 5-hydroxy-6, 7, 3', 4'-tetramethoxyflavone (4), 3'-hydroxy-5, 7, 8, 4'-tetramethoxyflavone (5), isosinensetin (6) and isoquercetrin (7), based on their spectra analysis. All of the six flavonoids were reported firstly from this plant. The ITS regions of 2 closely related species Allium tuberosum Rotuer. ex Spreng. and Alllium ramosum L. in Allium Sect. Rhiziridium G. Don were amplified, cloned and sequenced. The genetic re-lationships among 10 materials of diploid, triploid, tetraploid and aneuploid in Allium tuberosum and All-lium ranwsum were reconstructed based on ITS1 + ITS2 sequences. The results demonstrated that the aver-age Kimura pairwise distance between Allium tuberosum and Allium ramosum was 0.0146. They are a pair of closely related species. Although it was gone through evolution by artificial selection and natural selec-tion, Allium tuberosum kept little differentiation from Allium ramosum. Sequences of ITS region show that there are no evident differentiation among the various diploid, triploid, tetraploid and aneuploid of Allium tuberosum. In this paper, we analyzed the phylogenetic relationship of Thuidiaceae (s.l., Musci) using nuclear ribosomal DNA internal transcribed spacers (ITS), from which we got 6 species' ITS sequences of Thuidiaceae (s.l. ), including Abietinella abietina (AJ417494), Anomodon minor (AJ344145), Cl-aopodium aciculum (AJ315968), Thuilium pristocdyx (AJ416443), Thuadium assimile (AJ416442) and Herpetineuron toccoae (AJ315967), and then they were sequenced directly from PCR products. In this paper, the volatile oil of 18 samples from Cyathocline purpurea were determined by steam distilling method. 27 constituents of volatile oil were identified qualitatively and quantitatively by GC/MS. Three samples of volatile oil have been tested for cytotoxicity in cell growth inhibition against cultured L1210 murine leukemia cell. Maturation drying is a terminal event of seed development. Seeds can be categorized into ortho-dox, recalcitrant and intermediate seeds depending on their storage behaviour. A number of processes or mechanisms have been suggested to confer, or contribute to, desiccation tolerance of seeds. Different pro-cesses may confer protection against the consequences of loss of water at different hydration levels, and the absence or ineffective expression of one or more of these could determine the relative degree of desiccation sensitivity of seeds of individual species. The processes or mechanisms that have been implicated in desic-cation tolerance of seeds to date are: intracellular de-differentiation; metabolic 'switching off'; presence and efficient operation of antioxidant systems; accumulation of putatively protective molecules including late embryogenic abundant proteins, sucrose and certain oligosaccharides or galactosyi, amphipathic mole-cules, as well as oleosins; and the presence and operation of repair systems during rehydration of seeds. The main taxonomic characters, such as patterns of floral position, number of ovule per carpel and sexuality of flower in many species of subfamily Magnolioideae were observed in both field and cultivat-ed states (Kunming Botanical Garden) . The temiinal flowers were observed in some plants of tribe Michelieae that was thought having only ax-illary flowers before, such as M. yunnensis, M. sphaerantha, M.figo, M. macclurei, M. balansae. The axillary flowers of tribe Michelieae, in fact, occur tenninally on the abnormal short shoots, which arise from the leaf axils and grow abnormally. In contract, the terminal flowers occur on normal shoots. In the period of alabastrum, the flowers of Magnolia denudata and M. soulangiana of tribe Magnolieae occur tenninally on short shoots although they seem like occurring axillaryly. All flowers of subfamily Magnol-ioideae actually occur terminally on shoots at morphogenesis on the basis of our observations. Pollen morphology of fourteen species, including 4 variants and 2 populations in the genus In-carvellea Juss. were studied. The results indicated that the pollen morphology of the species studied are very similar. Pollen grains of the species are found in monad. They are oblate to subspheroidal in shape and always have 6-10 colpi. Their size is from 28 to 51 um in diameter. The interspecific similarity in pollen morphology implicates that the genus is monophyletic. In the family Bignoniaceae, the genus Incar-villea belongs to the tribe Tecomeae, but it is obviously different from any other genera among the tribe in pollen morphology, which suggested that the treatment of the genus Incarvillea in tribe Tecomeae might not be very natural. In the other hand, the pollen characters have limited value inside the genus and only a few species can be differentiated from each other. According to the interspecific difference, the subgenus Pt-eroscleris can be distinguished from other subgenera but it is affinitive to the subgenus Incarvillea. Four taxoids, lβ-hydroxy-2α, 7β-deacetylbaccatin I (1), lβ-hydroxybaccatin I (2) , 2α, 5α, 7β, 9α, 10β, 13α-hexaacetoxy-4 (20), 11-taxadiene (3) and 2-deacetoxy-5-decinnamoyl taxinine J (4), among which compound 1 was a new one, were isolated from the leaves and stems of Taxus chinensis. The structures of the compounds were elucidated by spectroscopic techniques. The wild flower biodiversity of NW Yunnan was studied based on our field investigation results combined with analyzing of literature data. The research results indicated that Northwest Yunnan is rich in wild flower resources. The total numbers of wild flower in NW Yunnan are 38 families, 324 genera and 2206 species with 1463 species of herbaceous plants, 743 species of woody plants, 751 endemic species and 35 species of rare and endangered species. The distribution patterns, ornamental value, types of flower colors, flowering time, endemic phenomenon and threatened status of the wild flower in NW Yun-nan were analyzed. The results indicated that the richness of the wild flower species in NW Yunnan are Li-jiang, Zhongdian, Gongshan, Deqin, Weixi, Heqing, Fugong, Exyuan, Dali and loping succes-sively. From the vertical distribution point of view, the main distribution areas of wild flowers in NW Yun-nan are concentrated in the areas at the altitude of 2400-3 000m and the areas above 3 500m. Three new species of the genus Viola described from Yunna,China.They are Viola jizushanensis;V.subdelavayi;V.binchuanensis. Tamarix L. is a genus with the distribution pattern of Old World Temperate. The distribution patterns of 3 recognized sections covering 68 species in Tamanx are analyzed, and the result showet that the three centers of frequency distribution possessed with diffesent quantities of species: the W. Asia sub-region of Irano-Turanian Region (30spp. /3sects., including 13 endemic species), the C. Asia subre-gion of Irano-Turanian Region (20spp. /2sects., including 6 endemic species), the Meditenanea Region (12spp. /3sects., including 6 endemic species). In the light of the fact that most taxa including the primitive and advanced ones, and the most taxa including the primitive and advanced ones in Tamarix oc-cur in the W. Asia. In this paper,the karyotype of Malania oleifera Chun et Lee has been reported for the first time. The result shows that the number of the somatic chromosome of the species is 26, and its basic chromosome number is x=13. The karyotype formula is 2n=2x=24m(2SAT)+2sm, and belongs to 1A type of Stebbins karyotypic symmetry. In this article, the recent progress made in studies of Mesozoic ginkgoaleans, especially those of the Chinese material, is summarized with a brief review of the origin and distribution of ginkgoaleans in the geological history. For a long time, our knowledge of ginkgoaleans has been obtained mainly from fos-sil leaves that are of little taxonomic and phylogenetic significance. The proposed classification was based on phylogenetic analyses of well-preserved taxa of which not only vegetative organs, but ovulate organs were known. It is supplemented here with the defining features, and geological and geographical distribu-tion of the extinct families. Trie taxonomic positions of taxa for vegetative organs are left undetermined un-less they are found related to reproductive organs. Tlie general evolutionary trends of ginkgoaleans since Permian was reduction of both vegetative and reproductive organs in spite of being greatly diversified in morphology in the Jurassic and Early Cretaceous time. Xilongshan is a large montain in N 22°26' - 22°46', E 102°32' - 103°04'. It covers an area about 1 000 km2 and is shared by China, Vietnam and Laos. The Chinese part with an area of 178 km2 and a related altitude about 2 500 m is located at WS Jinping of Yunnan province. In the precent paper, the vegetation of the Chinese part were reported for the first time and especially discussed the community com-position of Monlane mossy eveiygreen broad-leaf forest and Summit mossy dwarf forest in details. In the two types of vegetation, the dominajite species were represented by Rhodokia spp. (Mamamelidaceae) and Rhdodendron spp. (Ericaceae) respectively. The companions imply that the two kinds of Mossy forests are related in some way to those existed in NW Yunnan.